Opposition to the gospel seems to be heating up in the Land of Israel. While most Israelis are secular and tend to either be open or indifferent to our message, the religious minority is becoming increasingly hostile and is more and more willing to resort to bullying and even violence in their determination to stifle our message. "We faced opposition from outraged individuals as well as organized groups. 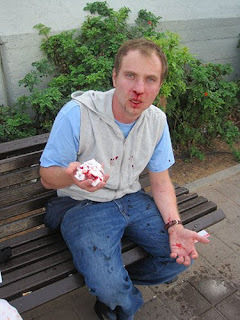 In Netanya, one team was trapped and beaten up by fifteen Orthodox. Other teams were chased, kicked and had fruit thrown at them. In Hadera, one team was kicked and pushed. As for bannering, two teams had stones and eggs thrown at them. One team's banner was broken and a team member's face was punched." "Two ultra-Orthodox men appeared and watched us for a couple of minutes. When I saw them bend over to pick up stones, I decided to take the team to our backup site. Those religious men were about twenty-five meters away from us. We began to cross the road to where many taxis passed by." "We approached a Sharoot bus and knocked on the door, but the driver did not open the door. At this point the taller of the two men held Vlad in a hammerlock. The second man was grabbing for the tract bag, trying to wrestle it away. He finally ripped the stitching in the bag strap and the bag came free. They shoved Vlad to the ground and the smaller of the two jumped onto him, and punched him four or five times while he cursed at him in English. As this man got to his feet, he turned and kicked Vlad square in the face with his boot, and then jogged off laughing. They were still carrying the bag and laughing as they went out of my view." "People in the cars shouted to us to call the police. A Muslim man, Ibrahim, witnessed some of the incident and brought me a bottle of water. A Jewish lady, Shiri, approached me and said that she saw everything that had happened and asked how she could help. I thanked her [and they got contact info from the man and woman.]" An ambulance came and Vlad spent five hours in the emergency room, where doctors reset his broken nose and put four stitches in his upper lip. The next day Vlad and one of the volunteers went to the police station to file a complaint. We see here a picture of both courage and cowardice in the land of Israel. I am so proud of the courage of our missionaries and volunteers who are willing to risk physical assaults to stand up for the Lord and proclaim His gospel. The branch brought a team back to the university, as it is important to let people know that violence will not stifle gospel proclamation. But it isn't easy and we need to continue to pray that God would sustain them and grant them continued courage to stand for the Lord. At the same time, I am embarrassed and angered by the cowardice of these religious young men and others like them who violently attack both young men and even young women, then run away rather than take the legal consequences of their behavior. In fact, I was concerned about sharing this incident with you lest anyone mistakenly think that these bullies represent the majority of Jewish people in Israel. Please believe me when I tell you they do not! This behavior is not what mainstream Judaism teaches nor is it considered acceptable behavior by the majority of the Jewish community in Israel or anywhere else. I think it is important for me to share this information because the situation is getting more violent among a religious minority, and we do need you to pray. Please pray for our staff in Israel, especially that God will bless and strengthen Vlad and his wife, as well as all our staff and volunteers, with continued courage and grace to press on despite those who are out to hurt us. We hope you also will pray that those who committed the criminal assault will be caught, and will not only be deterred from further assaults but will have their eyes opened to what is in their own hearts. Finally, please pray for us for wisdom in how to respond, as well as for protection from the Lord for our people. Of course it isn't just Jews for Jesus staff and volunteers who are facing this problem. 1. The May 15 mass public burning of New Testaments in the Tel Aviv suburb of Or Yehuda highlights a growing trend toward anti-missionary incitement in Jewish neighborhoods throughout Israel. Other notable incidents include the October firebombing of a Jerusalem church shared by Baptists and Messianic Jews (i.e. Jews who believe Jesus was the Messiah) and the March 20 bombing of a Messianic Jewish home in the West Bank settlement of Ariel, in which a 15-year-old boy was gravely wounded. Contacts in the Messianic Jewish and Evangelical congregations throughout Israel describe a worsening situation and allege complicity or complacency on the part of police, local governments and the Interior Ministry. For their part, anti-missionary groups such as the ultra-Orthodox Yad l'Achim appear more determined than ever to escalate their campaign against Christian and Messianic congregations that they see as "cults" determined to steal Jewish souls. We should not be surprised by the behavior of those who oppose the gospel. The Bible told us this would happen as we stand up and identify with our Lord. We, His servants, are not greater than our Master who experienced far worse at the hands of the religious leaders of His day. "But I say to you, love your enemies, bless those who curse you, do good to those who hate you, and pray for those who spitefully use you and persecute you" (Matthew 5:44). There you have it: love, bless, do good and pray. That seems a tall order, but it is what our Lord commanded. Would you pray for us to have the courage to follow our Messiah's teaching from this verse? First, we need to be praying for our persecutors, that they come to know their Messiah Jesus. Despite their cowardice and seeming delight in doing harm, we need to love them and do good to them. However, that does not mean we should give in to them. There are laws in Israel that can and should be upheld and when the religious opposition break these laws they should be held accountable. We need to be wise in how we relate to these people and their attacks. It takes praying courage to confront persecuting cowardice with resolve, with truth and with love. Please pray for believers in Israel to have these qualities in abundance in the days to come.